Do any of you know what tool I can use successfully to remove an old Falcon 5 speed freewheel (circa 1980's)? I have tried the Park Tool 1.5, which is too large in diameter. Absolutely have no idea what a "Park Tool 1.5" is, but n FR-7 is the one to use. Ahh, 1.5 was a typo. It was meant to be 1.2, as in FR-1.2. No dice on the FR-7 either. Bike Tools Etc. - 1000's of bicycle tools and parts for the home mechanic! No dice on the FR-7 either. Falcon freewheels seem to have a lot of variability. I will see if someone around here has one I can try. I'm keeping my fingers crossed. You going to re use the freewheel again ? if not , just have the LBS take it off, and buy a tool to remove it's replacement in the future. A good question. It has very few miles on it, so it's not unreasonable to continue using it. If I did have a LBS take it off (and I'm guessing render it unusable), what replacement freewheel could I use for it? Anything with the same hub thread would work; something with the same or smaller range of cogs would mean you wouldn't need to change the chain length, but it's often prudent to chain the chain at the same time as the freewheel. 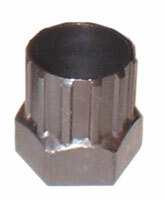 Perhaps is the smaller splined tool that requires removing the axle locknuts to remove the freewheel? I'm trying to find one. Park Tool doesn't have one in their lineup, and other offerings are obsolete. I think I may have found one, will know in a couple of days. Last edited by CustomSteel; 05-26-14 at 11:56 PM. I owned a Falcon bike and the OP probably needs a two prong Mallard type freewheel removed. I am sure they can be found in most bike shops. Good luck OP. Thanks Roadie1! It's actually a 12-spline design, it's just a little smaller than the normal ones out there. I think I found a tool that fits, but will have to wait until it arrives to deliver a verdict. I'll post some photos and whatnot as well. The CT4 tool from Bicycle Research was successful!! Be warned that it needs a firm bite, you have to knock the axle out (literally, the cones were pressed too hard and stuck in the caps for the bearing races) or you will risk rounding out the tool because it has less than half of a purchase in the splines. The tool's teeth are pretty shallow as well, but it works without question. Thanks again for the suggestions and encouragement!